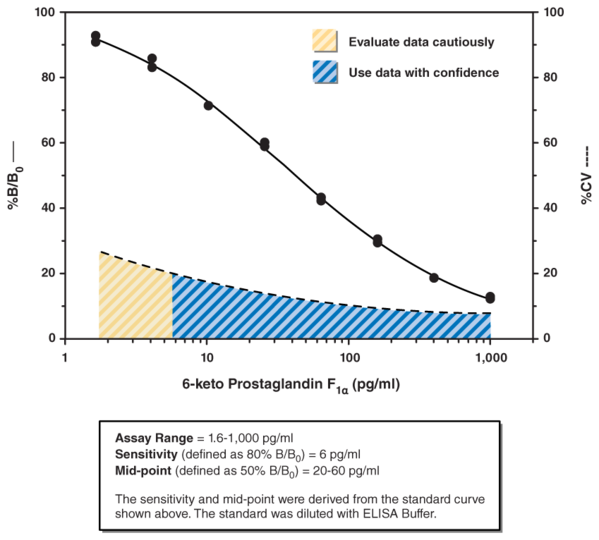 Product information "6-keto Prostaglandin F1alpha ELISA Kit"
Prostacyclin (Prostaglandin I2, PGI2) is formed from arachidonic acid primarily by the vascular endothelium and renal cortex. It is a potent vasodilator and inhibitor of platelet aggregation. PGI2 is non-enzymatically hydrated to 6-keto PGF1alpha (t½ = 2-3 minutes), and then quickly converted to the major metabolite, 2,3-dinor-6-keto PGF1alpha (t½ = 30 minutes). Prostacyclin was once thought to be a circulating hormone that regulated platelet-vasculature interactions, but the rate of secretion into circulation coupled with the short half-life indicate that prostacyclin functions locally. Although 6-keto PGF1alpha is commonly measured in plasma and urine as an estimate of prostacyclin synthesis, it should be noted that there may be more than one source of PGI2 in these samples. For instance, venipuncture may cause the release of prostacyclin which will artifactually increase the 6-keto PGF1alpha concentration in plasma. Urinary concentrations of 6-keto PGF1alpha are confounded by the fact that some plasma prostacyclin (~14%) is excreted into urine as 6-keto PGF1alpha and the remainder is of renal origin. Therefore, it is important to take these factors into account when analyzing data. Customer review for "6-keto Prostaglandin F1alpha ELISA Kit"